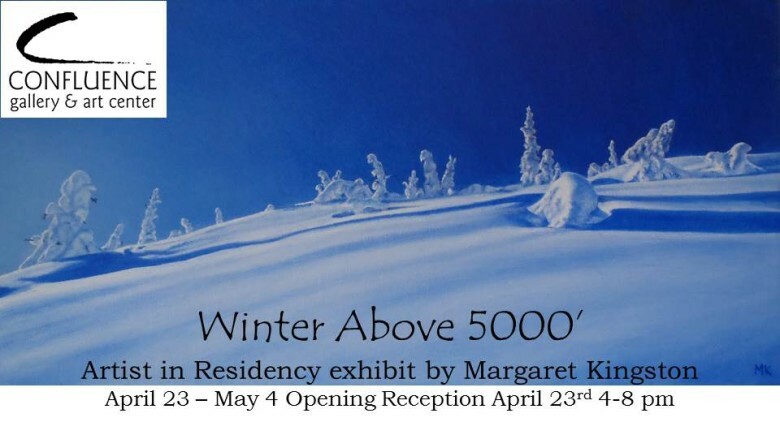 Confluence Gallery Artist in Residence and Methow Arts Teaching Artist, Margaret Kingston, shares her work in a solo exhibit entitled Winter at 5000′. Inspired by the phenomenal El Nino Winter we received here in the North Cascades, Margaret Kingston, worked to capture with oil paint on canvas, the serene feeling of being in the mountains. The constant precipitation with very little wind during December and January allowed the snow to continue piling up on trees and rocks until they were unrecognizable and seemed to be living characters. Eventually, there were so many layers of hardened snow that trees were breaking under the weight. These winter landscapes inspired the body of work Margaret will present at Confluence Gallery at the conclusion of her three month Artist in Residency. Works will be on view in the gallery gift shop April 23 – May 4th, with an opening reception April 23rd 4-8pm.